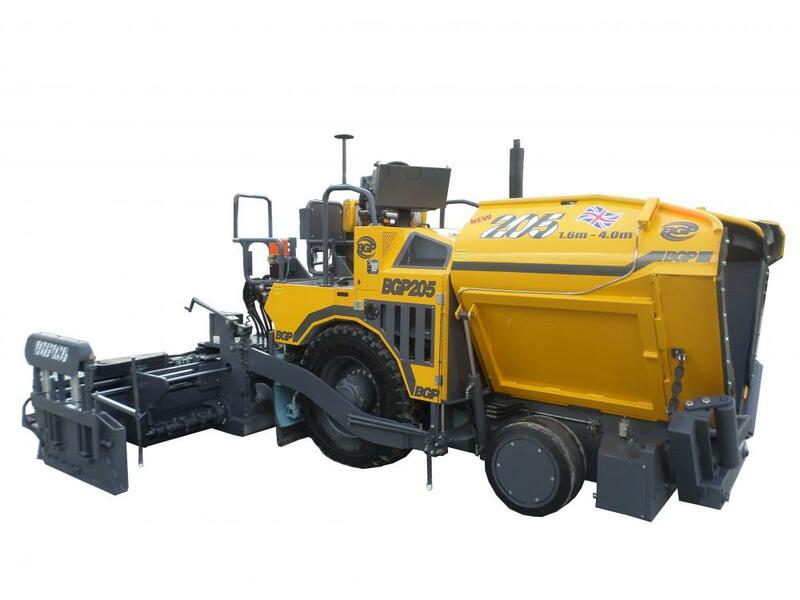 The all new BGP 205 is an ultra compact wheeled paver with a basic envelope machine width of 1.6 metres,the BGP 205 is an ideal fit for footpaths, cycle ways, car parks, narrow lanes etc with room to spare. This machine is equipped with a double extension screed unit providing on the move hydraulic paving width from 1.6-4.0 metres. Each screed extension is able to be trimmed effortlessly on the move to ensure correct allignment to the main screed section. A main feature of the BGP 205 is the primary 1st stage screed extensions, each are equipped with their own Auger section, this gives a constant material flow to both the primary screed extension and the secondary screed extension. The BGP 205 boasts very impressive traction, the machine is equipped with a high torque ratio planetary drive system mounted within an over wide (380mm) hydroflated footprint drive tyre. The substantial tractive effort is complemented further with a full time hydraulic front wheel drive system which receives additional boost from the automatic timed engagement of the hydraulic differential lock when paving commences from a standing start. The BGP 205 also acheives exceptional manouevrability from its close dimensioned wheel base, large diameter single wheel pivot steer radius and its ability to spin turn within its own compact length. The V16-40 screed unit is of sturdy construction. Each extension is equipped with its own individual torque arresting support rods of ample diameter to ensure screed allignment is maintained under the material load. Individual - inboard and outboard extension height adjustment jacks enables on the move trimming of the primary and secondary screed extensions to be a simple operation. BGP V16-40 screed unit Features Electric Screed Heating, Individual Height Adjusting Extensions, Vibration on all sections and is equipped with switch operated twin actuator height adjusting side plates with heating. The machines operators console features a simple centre pivot that allows the operator to be seated outboard of the machines basic width improving his drive line visibility. The driver console of the BGP 205 features the most simplistic and operator friendly layouts with operator ergonomic consideration at the forefront of its purpose simplistic design. The BGP 205's unique in built Auger extension is a very efficient and labour saving method of ensuring both the primary and secondary screed extension are supplied with a constant and sufficient vital head of material to keep the 205 Paving width fewer stop-start interuptions to the paving operation. The BGP 205 material receiving hopper is available (optional equipment) with a hydraulic hinged centre conveyor and hopper raise-lower floor apron plates to reduce material spillage from the receiving hopper, whilst reducing manual hand work in at times unsited areas. Unique LED flashing Safety lighting compliments the hinged hopper apron plates. The LED stop-go system signals to the delivery truck a safe and appropriate time to reverse to the delivery truck to couple with the machine. The BGP 205 is equipped with an oversized wide footprint drive tyre providing substantial contact area to the ground, both the traction and grip acheived from the high flotation traction tyre is impressive, further tractive effort is boosted from the 205's full time hydraulic proportional front wheel drive system. The machines front steer wheel is mounted on a transverse position pivot axle beam that ensures constant ground contact when paving at all times.